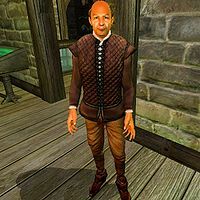 Contumeliorus Florius, an Imperial mage, is an Evoker of the Mages Guild who offers Recharging services at the Chorrol Guild Hall. He lives a relaxed lifestyle with much food and little exercise. After waking up at 8am, he will spend his morning either reading the common text Manual of Spellcraft (40% chance) or wandering around the basement. At midday he will leave to eat lunch at The Oak and Crosier until 4pm, when he heads back to the Guild Hall. As soon as he arrives he leaves for the basement where he consumes another four-hour meal in isolation. From 8pm until his bedtime at 1am, he will be found reading in the basement. He offers his services when not eating or sleeping. He wears middle-class attire consisting of a quilted doublet, tan linens, and a pair of doeskin shoes. He also carries his book and a meager amount of gold. He doesn't wield any weapons, relying instead on a set of leveled spells from all of the magical schools. Other than having a mouthful of a name, he also possesses a corny sense of humor: "I'm Contumeliorus Florius. I'm in charge of enchanted item recharge in the Mages Guild here in Chorrol. Get it? "In charge!"" He will also reflect on the advantages of guild membership: "Smart thing is to join a guild. Any guild. Gets you a place to sleep for free. No muss, no fuss, no crummy tavern food and lice-ridden beds." Oddly, despite having the rank of Evoker in the guild, he complains about not having access to the Arcane University: "I wish I were qualified to have access to the Arcane University. Enchanting items whenever I want... ah, well. Maybe someday." Florius will direct you to Teekeeus should you want to join the guild: "I keep to myself around here. If you want to join the guild, go find Teekeeus. He's in charge of that sort of stuff here in Chorrol." and also has a few words to say about Earana: "I'd steer clear of her if I were you. She has it in for Teekeeus, and wouldn't hesitate to take any of us down with him." Esta página foi modificada pela última vez à(s) 18h54min de 27 de fevereiro de 2013.